So I’ve been reading a lot into the primal lifestyle (see the last post, and probably posts all the way back to September, for hints and what not). It’s been a pretty logical progression for me. First, I started off this year learning how to cook a little better. More specifically, I’ve been trying new recipes and perfecting techniques since August and/or September. Some of my experiments have been delicious, others, lacking. During that, I stumbled onto the Mason Jar madness… making little gift jars and stuff. During that period, I found some really cool “meals in jars” ideas that led me to preparing and packaging food a little better to prevent waste. That brought me to buying a small vacuum sealer, to help me seal my jars and keep my food fresh, longer. Which led me to wondering what sort of meals I could put in these jars. Which led me to “primal” and “paleo,” both lifestyles I’ve browsed extensively on the internet, but have never tried. The basic idea is to focus on consuming meat and veggies over grains and processed foods. The difference between “paleo” and “primal” is that paleo denies dairy products, whereas primal does not. The reasons I want to try the Primal lifestyle are simple. One, I want to learn how to cook delicious, delicious meat. Every time. Part of the problem when I cook is that I screw up the meat, and then the entire meal is kinda… blah. I want to eat meals that are easy and reliably delicious. Two, I want to spend less on processed foods at the grocery store. I bought a SodaStream on clearance, and that helped, some, but only for soda cans. Most often, I end up tossing out sandwich meat, leftover pizza, or leftover mediocre meat. Three, I’ve heard that in some people, the primal and/or paleo lifestyles help them figure out their migraine triggers and alleviate stress. I don’t think that primal and/or paleo will cure my migraines, but it might help me get them under control if whatever I put in my mouth, I cook. Obviously there will be times where I want to / have to go out or eat during social functions, and that’s fine. But I want to guarantee that by the end of 2013, most of what I make, in my kitchen, is hands down delicious. Four, I’ve unfortunately gained some weight in the past two years, with my breakup and some other life changes. Whereas before, I was teetering on the “not THAT fat” range, I feel like I’ve exceeded it and I could be performing better, physically, in other areas of my life, like in my field work and in my soccer playing. I want to emphasize that I am not focused on the weight loss aspect of this: it just may be an added benefit. It may also be that I maintain my weight, but my body composition changes. So this is my primary blogging place. I am not turning this into a food blog! But you may see me posting more recipes and primal oriented ideas. To recap, I am trying to eat “Primal” food because I want to better my cooking skills, I want to save money on groceries, I want to see how it will affect my migraines, and I want to improve my physical condition. I’ll be putting a “page” up (one of the links in the header) to connect all of my food articles together. Stay tuned! Ever have a butterfly flit across your path as you take a walk in the late morning? What did it make you think of, with its little wings buoying it up into the air time and time again? Was it flying with purpose, racing down the road to the next patch of flowers? Butterflies can teach us a lot on a spiritual level, and given that I’ve been a nearly-professional butterfly watcher, I’m going to share some of my insights. 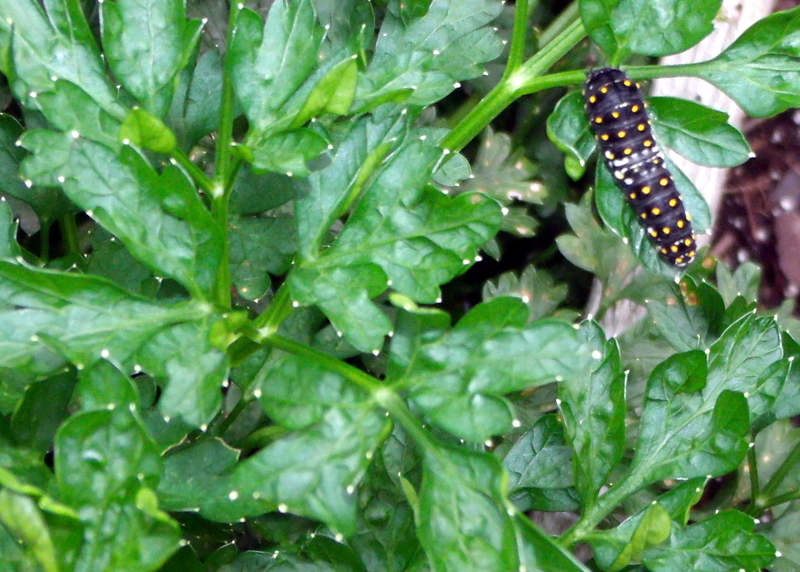 A black swallowtail larvae munches on some parsley in a garden, mimicking bird poop with its black body and white stripes. First, butterflies can teach us that life isn’t always about being an adult. In most cases for butterflies and moths, the adult stage is the shortest lived life stage they have. Butterflies tend to spend longer as egg, caterpillar and/or pupa than they do as adults. We can apply this idea to our own lives and make the life stage that we’re in now, the most important one. Second, and along these lines, butterflies have two main strategies for dealing with the world around them: They either make themselves obnoxiously visible, in often gorgeous colors, or, in stark contrast, ridiculously hard to find. Though some of these more obnoxious color schemes mimic more poisonous organisms, or indicate that they are, themselves, poisonous, the fact remains that more visible creatures have a higher chance of being picked off by some unsuspecting predator. The ones that blend in, they play it smart, but at what cost? It certainly may make mates harder to find. But drab-colored moths and butterflies with bright eye spots may frighten away potential predators. We can apply this duality within ourselves – which part of yourself do you want to camouflage? Which part do you want to show to the world? Putting on a brave face, like those butterflies with bright colors, may be a good strategy… but sometimes, you should probably just go ahead and fade into the background. Have you dreamed of butterflies? What colors are they? Butterflies are also, for us, symbols of getting a fresh start. Although adult butterflies may retain some memories of their caterpillar experiences, emerging as an adult butterfly is an iconic way to get a fresh start. If you want to wipe clean your slate, you may want to visualize pupating, shedding all that is wrong with you, and then emerging as an adult butterfly, fresh faced and ready to return to the world. Step 1. Obtain a breadmaker. I found my breadmaker at our local goodwill for six dollars, over two years ago. I’ve probably made about 10 things with it, which means that all in all, my breadmaker was well worth it. I found the guide for the breadmaker online, which means, I have all of the recipes that come with it, too. Step 2. Obtain a recipe (provided) and ingredients (not). My boyfriend really likes using buns as bread, and so, I generally do that instead of try to make loaves of bread. Although it takes a little longer, it saves us the effort of having to cut up bread to use whenever we need it. With these, we can just grab and go. I got this recipe from Man Tested Recipes, and I love it, because its small, and easy to do. After you taste test this recipe, once, you may want to consider preparing it several times over in mason jars or plastic bags to keep as a “ready made” version. To do this, combine all ingredients except WET ingredients and YEAST. Store in an airtight container. You’ll need about 2 cups of space. Follow your breadmaker instructions, but mine says, add wet, then dry, then yeast. So I add the egg, milk, and butter to the bottom of the breadmaker bowl, then add the flour, sugar, and salt on top. On top of that, I add the yeast. I set my breadmaker to the “dough” setting and let it run through. Mine takes 2 hours, but you can stop it after the initial mixing to check. If it looks powdery, add some milk. If it looks runny, add some flour. After the dough is done, I divide it into four roughly equal sections, pound it down, and let it rise under a towel for 30 minutes. I then bake it in an unpreheated oven at 375 deg. F. for 15-20 minutes. I often double this recipe because we tend to eat all of the buns when I make them. So, I don’t perform rituals much anymore – I’m always in the wrong spot at the wrong time, etc. I do have small ceremonies, often without tools like chalices or even food offerings for the gods. Sometimes I just take some time to sit in silence and think, and pray, and maybe even sing a little. Those were my activities on Beltane night. I sat on a bench, feeling the cool breeze and the wet air, the promise of summer still far away. I thought about my life and where it has come from and where it’s going, and also about my partner’s life. My partner has been having some issues lately – the economy hit him hard and for a while, he was jobless. We live quite a distance away from each other, and I can’t be there for him when I need to. In any case, I ended up just praying that he would find happiness again, and not three days later, he made an opportunity for himself and he now has a job. It was a surprising career choice, but you take what you can get, and I’m definitely not complaining. In the end, that’s all I want. For those I love to be happy and safe and well cared for. I hope that this Beltane – or soon after – has found you all the same blessings. That’s the thing about prayer. You walk around in a fog for a long time before you sit down to pray – you complain, you think its unfair or too tough or none of it is your fault, etc. You get angry at the world. Depressed, sad, maybe you cry. And when you’re done throwing your temper tantrum, what you do next is most important: Sit down. Think. Sing. Pray. Decide what you want and how you’re going to get it. And then do it. You have support when you’re at your lowest point. Granted, our gods don’t carry you through. They pick you up, dust you off, and remind you that you have two feet and a world of opportunity. But isn’t that all we ever need? Does anyone else have the underlying feeling that if they just collect the old books and the classics, the videos and the DVDs, and fill their surroundings with “intelligence,” it might rub off? There has to be something in the idea, I know more people than myself do it. I will occasionally pick up one of my “smart people” books – whether it’s a classic like John Milton’s Paradise Lost or a total nerd book like Neuroscience in Medicine – and read or skim my way through some parts. I’m no better with pagan books – I love resource guides like Cunningham’s Magical Encyclopedia of Herbs(not sure on the name there). It’s really cool to start using them though! And being around someone else’s collection – whether you’re in a library or a church or someone’s house – is fascinating! I’m housesitting right now, so I look up and I see all of these plant and math and business and classic books of literature. It just makes me so happy that for these two weeks, I have the opportunity to surround myself with knowledge and learn something new every day. Magically, does this have any influence? I’d say it does. A brand new book doesn’t have any sort of energy really attached to it, except the new book smell. But handling a book creates an interaction – reading is projective(You’re speaking those words, either in your mind or aloud). And as my high priest says, where attention goes, energy flows. And so, we’re in essence, charging the book. Used books come pre charged, if you will. And then you’ll be sleeping in the room with that book. Or playing on your computer with that book. Or at least, in the same house as that book. Which is now reinforcing what you learned. So, if you find old books that represent something you want in your life, think about purchasing them. They might *actually* help your motivation towards learning new things. To come back briefly to cleansing: be careful what you wish for. On Lammas, I performed a ritual, and somewhere within there, I asked to be cleansed and purified and strengthened. I came back home to find a bad sinus headache, stomach ache combination; and sweating and everything else. My body was rebelling against its own existence. But when it was over – maybe a half an hour, or an hour of pain – it felt so very nice. That is how my body cleanses. I hope yours does it in a slightly less painful way.